First Appearance: The Uncanny X-Men (vol. 1) #392 (Apr. 2001): "From the Ashes of the Past... Still Another Genesis!" Paulie Provenzano was strongly anti-gay, which temporarily caused some friction between himself and openly LGBT teammate Northstar. Paulie was only briefly a member of the X-Men. He was recruited by Jean Grey to be part of a temporary incarnation of the team sometimes known as the "Eve of Destruction X-Men." After their mission to stop Magneto's Genosha-based war against the rest of the world, Paulie was offered permanent membership in the X-Men. But he declined the offer and returned home to Brooklyn. Powers & History: Invulnerability. Paulie was just a guy from Brooklyn who went to the Marines, where he discovered that it was virtually impossible to hurt him. 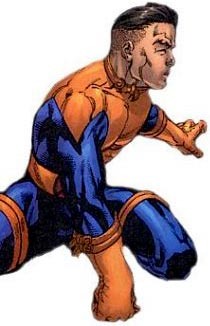 As a result of his training and his mutant physiology, he is also a little stronger than a normal human. When Paulie returned home after his tour of duty, he confroted the local mob bosses in his old neighborhood and demanded half of their take. The bosses shot at Paulie, which only made him mad, and he beat the snot out of them. At that point Paulie was contacted by Phoenix IV, who was rounding up mutants to help her save Professor X, who had been captured by Magneto. Paulie agreed to join the X-Men for the mission, though his motivation was more Jean herself than any belief in Xavier's dream. Things went from annoying to awful when Paulie discovered that one of his teammates was Northstar, and Paulie didn't want to be on the same squad as a "limp-wristed mapleleaf." Homophobia notwithstanding, Paulie remained on the team after Jean broke up the brawl between him and Jean-Paul. It should be noted that Northstar gave Paulie a nosebleed using super-fast punches, indicating that Provenzano may not be completely invulnerable to rapid attacks. In Genosha, Paulie was thrown out into space by Magneto and ironically, Northstar had to save him using mouth-to-mouth resuscitation. While Paulie was initally upset (and disgusted), he realized Jean-Paul had saved his life and curbed further agression toward him. Finaly, though Paulie proved fairly resistant to Magneto's powers, and even seemed to be getting into the idea of being an X-Man, he left the team after Xavier's rescue ad presumably returned to his home in Brooklyn.